50 Grams – Would it make you a better angler? 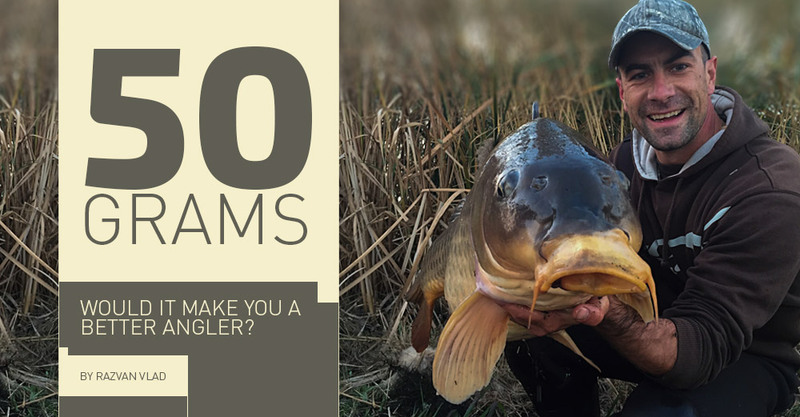 Home » Blog » 50 Grams – Would it make you a better angler? But, it has never crossed my mind to call it more than what it was, 50 grams or not. Would being part of the 50 pounder ‘club’ make me a better angler? This year I was fortunate to catch a new PB. It was the same fish I caught little over a year ago, and it weighed about 1kg more compared to my previous record. I was buzzing from this new achievement. The fish had put up a battle of note, pulling me through weed beds several times before finally giving in. It was an astonishing battle that will stay with me for a very long time. After netting it, I let it rest in the shallows while I soaked the mat and filled a bucket with water. Lifting a 20kg plus carp out of the water between the weeds is not an easy task, so I had to use a weigh sling – it has more cushioning, and the carp is more secured. The electronic scale announced my new PB at 22,650kg. That is an awesome achievement for any carp angler. We all have goals and targets, and one of those is the almost mythical weights that the UK carp anglers have made famous over time... the 40 to 50 pounders. You may ask what it has to do with my story? A quick Google search will reveal that 50 pounds equal 22,680kg. I had checked my scale a day later and it had an error of 20 grams which, as the title says, put me 50 grams away from the famed 50lbs mark. Now to get to my grief: I have noticed a lot of posts on social media with carp reported at certain weights. They spark arguments to the point where individuals are threatening one another, and arguing about who the better angler is and which fish weighs how much. I have avoided these types of arguments as they are not constructive at all. I could have called my fish a 50 pounder and (most probably) no one would have noticed or argued with me (we are talking 50 grams here). But, it has never crossed my mind to call it more than what it was, 50 grams or not. Would being part of the 50 pounder ‘club’ make me a better angler? I don’t think so, but that’s not the argument I am trying to make. What happens when I catch an actual 50 pounder? I would be very happy, but if I had lied, this ‘achievement’ would only be a second fish for me, which would not make it as great as it would be when I know it’s my actual first 50. I would be the only one knowing that. I see a lot of young anglers posting pictures with alleged 16 to 18kg carp that at a quick glance would need a few more years to get to that size. The big questions are: are they educated in operating their scales correctly, and secondly, why would they lie about the size and post it on social media? What happens if in two month’s time the angler catches a ‘real’ 16 to 18kg carp? Then anyone can match the two pictures and decide for themselves. I’m not pointing fingers here, and I do understand that we are designed to push our limits and achieve more every time. But, in not being truthful, you will have to face yourself every time you catch a carp and report its weight. What if the carp is 12kg and you report it at 14kg, then you catch a 14kg and report it 16kg, then a 17kg and report it at 21kg. Where does it stop? If I see an angler with four carp over 10kg, I will think that he knows more about what he is doing right then someone else who caught that one ‘fluke’ 16kg and no other notable catches. The angler with more carp on the bank will catch a bigger one when the time is right. He will know what he did right and wrong, being able to repeat the catches compared to the lucky angler who got a fish in a lifetime, for a lifetime. So far I have mentioned more numbers than what you will find in a boilie recipe. At the end of the day this is what they are, just numbers. In a pond where you have an average of 5 to 6kgs, a catch of 10kg will be an awesome achievement. A 50 pounder, in a big carp lake in France, is only an average size fish. At the end of the day, anglers should be enjoying themselves and not worry about reports; the weight should be a personal achievement. From my side, I will not post weights anymore and if I do catch a PB; it will be just that, a personal achievement. Until next time, catch a big one.